Every now and then several species of old-world Warblers of the genus Phylloscopus are observed feeding on pollen and nectar. This habit is usually found during migratory periods and is thought to be associated by scientists as a means of building energy after or before long-distance flights. So far, migratory Phylloscopus warblers have been observed visiting the flowers of various plant species, including eucalyptus trees, aloes and capers. 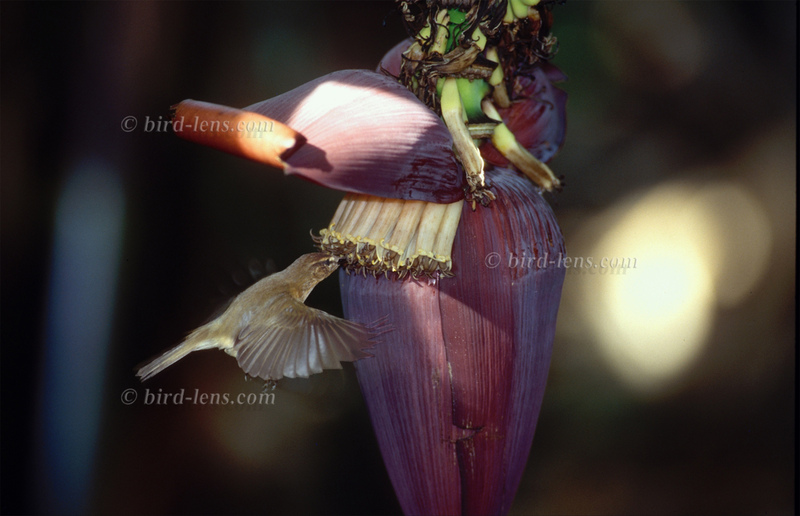 The fact that nectarivory is not restricted to migratory birds is proved by this picture showing a Canary Islands Chiffchaff (Phylloscopus canariensis) on the island of Tenerife visiting the flowers of an ornamental banana tree. Although this habit has been rarely observed or photographed, this individual has apparently learned to hover in front of the corollas and is able to feed nectar almost like a hummingbird (Trochilidae) or sunbird (Nectariniidae). It can be seen that this species is not a migratory bird, because the Canary Islands Chiffchaff is a native species of the Canaries, although closely related to central European Common Chiffchaff (Phylloscopus collybita) or the Iberian Chiffchaff (Phylloscopus ibericus). The Canary Islands Chiffchaff has more rounded wing tips than its northern relatives and the characteristic wing shape is clearly visible here.